Used Vauxhall Adam Review - 2013-present | What Car? 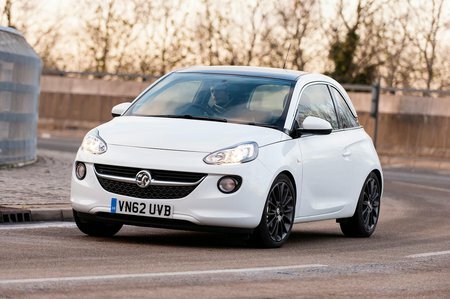 What's the used Vauxhall Adam hatchback like? There’s a growing trend in the car industry to offer small cars with premium equipment and smart styling. It works well for retired people who need to downsize from a bigger, more luxurious car into something with smaller running costs. And it works for city types that want high-tech gadgets, but in something they can park. The Vauxhall Adam is the car that hopes to please both. As mentioned earlier, there is a growing market for posh city cars, so the Adam doesn’t have the market all to itself. It’s got to compete with the likes of the Fiat 500, the Volkswagen Up and Smart Fortwo coupe. The engine range consists only of petrol power. The range starts with a slow but smooth 69bhp 1.2, or either an 86bhp or a 99bhp 1.4. These engines were joined later by a 113bhp turbocharged 1.0-litre three-cylinder and a 148bhp 1.4-litre turbo. If you’re hoping that the most powerful Adam is something of a mini-hot hatch, think again. It’s nippy, but there isn’t much point in revving the engine out because it has plenty of torque in the mid-range. The brakes are beefier and it gets altered suspension, but it isn’t involving enough to be fun. Regular versions of the Adam make much more sense, particularly the 1.0-litre turbo, which is punchy and it has a six-speed gearbox. Sadly, the driving experience isn’t as impressive as the 1.0-litre engine. The ride is brittle: it fidgets over scruffy surfaces and thumps over potholes and ridges in the road. This is a particular problem on cars with big alloy wheels and sports suspension. The Rocks models all get a jacked up ride height and all-season tyres, but they aren’t any more comfortable and those tyre kick up quite a bit of road noise. The steering is much better suited to city driving rather than blasting along a country road because it's light and doesn't progressively weight up in corners. Space inside is also a letdown. Legroom in the rear is very tight behind an average height driver and the boot is tiny. It also has an awkward parcel shelf that needs to be put down manually every time you go to close the boot, otherwise, it’ll block your rear vision. There aren’t many clever storage bins around to hide your belongings away in and the glove box is only big enough for the owner’s manual. Leg and headroom up front are fine, though.